Ford Focus Electric at the Geneva Auto Show. The first electric car in Ford’s long history is the Focus Electric. The Focus Electric starts at $39,200 — almost the same price as the Chevy Volt. Unlike the Volt, the Focus Electric does not have an auxiliary gas engine to power the electric motor if the battery dies. This means potential Focus buyers, like Nissan Leaf buyers, may end up suffering from “range anxiety” – that nagging fear of being stranded, possibly across from a gas station, while dreading a sadistic Chevy Volt owner stopping by to offer you a gallon of gas. But enough fear mongering. I think most potential electric car buyers are well aware of electric car limitations and will purchase and plan accordingly. Realistically, if you have a 60-70 mile a day commute an electric car is a risky purchase. However, most people have at most a fifty mile commute and as long as they plug in their car each night they should be fine. Since my personal commute is no more than 10 miles a day, I wouldn’t think twice about buying an electric car… if I could afford it. And there’s the rub, the Focus, like the other electric vehicles on the market, is a long way from cheap. One way to measure a car’s affordability is its life cycle cost. Life cycle cost is how businesses justify many of their expensive purchases. A large initial investment can be offset by low cost of operation. A good example is a laser jet printer versus an ink jet printer. Ink jet printers have a very low initial investment, but use a lot of ink; the manufacturers make their money on the back-end purchase of ink. Laser jet printers cost more up front, but their toner cartridges last much longer so for businesses that do a lot of printing the laser jet printer is the better purchase in terms of life cycle cost, even though the initial purchase prices can be many times that of an ink jet. The sad truth is, for now at least, it’s best not to look at an electric car in terms of life cycle cost. Unless gas costs close to $5 per gallon and you drive around 12,000 miles a year an electric car can’t be justified purely on life cycle cost. Most electric cars, especially the Focus, are just too expensive, even if they never need repairs, to justify the investment. But if you can afford to, forget about life cycle cost and consider some advantages that you can’t put a number to. After all, how do you measure the value of not having to drive to a gas station on a cold winter day with a wind-chill of minus 20? Or not spilling gas on your leather gloves or your good shoes? Or never having to worry about replacing your exhaust system or even checking the oil? And those are just my reasons for liking electric cars, I’m sure my readers (all three of you) can come up with many more. But enough about electric cars in general, let’s look at the Focus. One of the first things I noticed when I visited Ford’s website for the Focus Electric was the lack of information regarding driving range. They really bury it. When I visited the FAQ page I was surprised to find that not a single frequently asked question in the “General” category had anything to do with how far the Focus would go on a full charge. Call me cynical but I find it hard to believe that people are frequently asking questions like “What company is supplying the laminated lithium-ion batteries”. 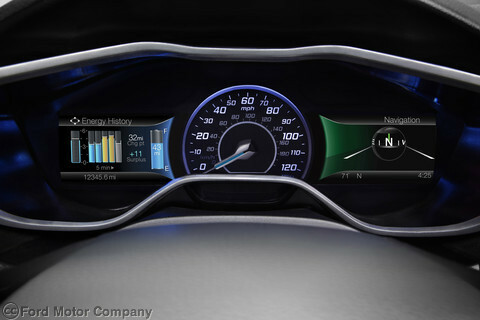 But thankfully I found the “Range” category; it states “The 2013 Ford Focus Electric is projected to be the first five-passenger all-electric vehicle with a combined fuel efficiency rating of over 100 MPGe”. For the record, MPGe is an estimate based on EPA ZEV Certification Testing. That’s Ford’s way of saying the Focus Electric might get more than 100 miles per charge. Based on my research, in real life usage, the Focus will get about 60-80 miles per charge depending on weather conditions and how you drive. All things considered, not a bad number. 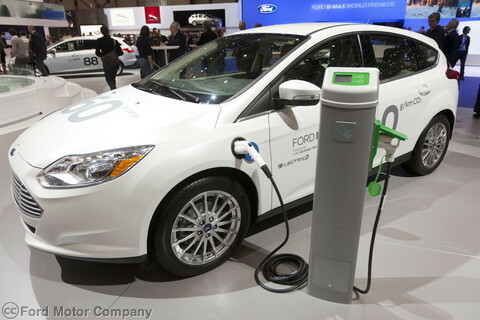 In addition to the high initial cost of the Focus Electric (even after the $7,500 tax break) there may the additional expense of a 240-volt charging station. This generally adds about $1,500 to the price of the car (there are some states that offer rebates towards the purchase of the charging station to help bring the cost down). While the charging station is not required it is strongly recommended because it cuts a 20-hour charge time down to about 4 hours. Ford has teamed up with the Best Buy “Geek Squad” to handle installation of the charging station after the purchase. The $1,500 price tag includes installation, but if there is something unusual about your house or garage’s electrical system it could run more. The Focus has many nice features designed to make it fun and easy to live with. 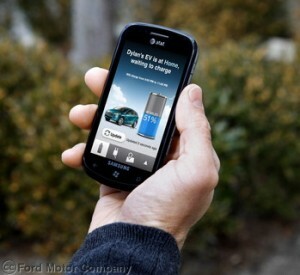 One of the nicest features is the MyFord® Mobile app. This app allows you to heat or cool your car to a comfortable temperature while it is still plugged in – saving significant battery power when the car is on the road. The MyFord® Mobile app is supported by iPad and most smart phones. The app also lets you schedule and monitor the charging of your car. Scheduling the charge at night is a particularly good idea if you live in a city that has off-peak utility rates. 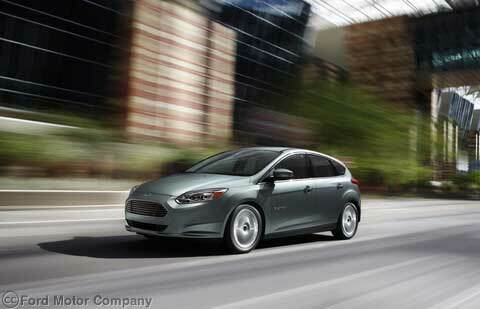 Like most hybrids the Focus Electric uses regenerative braking to help keep the battery charged. It also offers heated seats in addition to automatic climate control to reduce drain on the battery. The heated seats warm you up quickly, the climate control prevents you from running the heater any longer than necessary. Everything about the Focus is designed to conserve the battery, even the HID headlights. High Intensity Discharge headlights are more expensive, but they use less energy than regular headlights. Also, like most hybrids, the Focus has a smart key system so that just having the key with you is enough to unlock the doors and start the car without inserting the key in a keyhole. The smart key doesn’t save any energy, but it is a convenient feature. It’s hard to write about the Ford Focus Electric and not mention its main electric competitor, the Nissan Leaf. The Leaf, about two inches longer than the Focus, was released about a year earlier and is about $4,000 cheaper. Why the big price difference? No idea. They seem like very comparable cars to me. There is also the Mitsubishi MiEV which is an electric car even cheaper than the Leaf, but from what I’ve read, there’s a reason. Every review I’ve seen of the MiEV has been negative. I’ve included a table comparing the Leaf and the Focus at the end of this article; in addition to a picture gallery. Currently the Focus is sold only at selected dealerships while Leaf is available from any Nissan dealer. Ford only expects to sell about 10,000 Focus Electrics per year which strikes me as a realistic number based on the sales of the Nissan Leaf. After all is said and done, this may not be the time to purchase an electric car. Still, that time may not be far away if gas prices continue to climb like they have been. Manufacturers like Nissan and Ford (and BYD in China and Renault in France) are betting that gas prices will continue to climb. Everything would indicate they are probably right. Estimated time to full charge w/charging station 4 hrs. 7 hrs. Estimated time to full charge using 110-volt power cord 20 hrs. 20 hrs. Curb weight 3,624 lbs. 3,385 lbs. 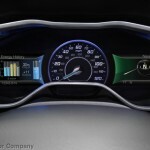 Ford Focus Image Gallery. Click any image to open it in a new browser window.